Image of the Planar monopole with parasitic inverted-L element. 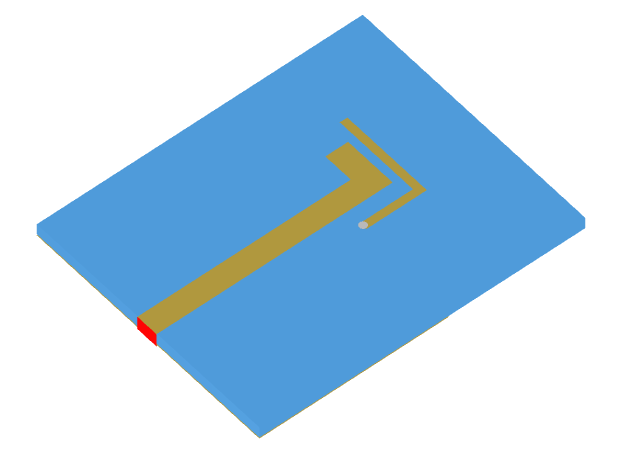 The planar monopole with parasitic inverted L antenna is ideal for integration in WLAN applications. It operates in 3 WLAN bands and it is compact with low manufacturing costs. The operation of this antenna can be understood by considering a printed L-monopole. The addition of a second parasitic L-strip (which is electromagnetically coupled to the driven L and supports an additional resonance) provides multiband performance. When correctly designed, the parasitic L-element is smaller than an L-monopole that would typically be required to support the lower resonance, resulting in a reasonably compact topology. 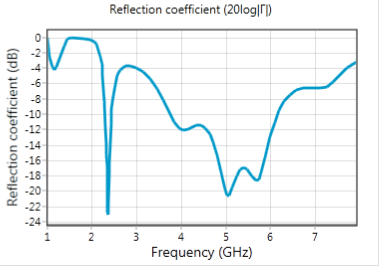 The following graph shows the antenna's |S11| performance across the desired WLAN bands. 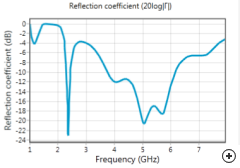 |S11| performance over 3 WLAN bands.